See Venus Shine with Jupiter and the Moon This Week! See Jupiter and Venus with the crescent moon in the southwest sky this week. Planet watchers are in for a special show this week, as the bright celestial bodies Venus and Jupiter shine in the sky alongside the crescent moon. You can catch the show tonight (Aug. 15) and tomorrow (Aug. 16) — as long as the skies are clear. On those days, look for the sky show just after sunset, in the western sky. 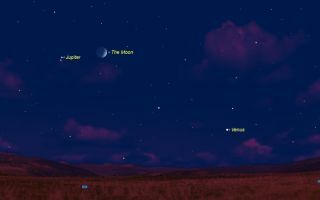 Jupiter will be shining well above the horizon and will appear as a bright light to the left of the moon, according to EarthSky.org. To find Venus, look to the right of the moon and then peer down. Venus will be there, just above the horizon. The planets will be best visible together between 8:30 p.m. and 10 p.m. local time on both nights, according to WHIO-TV7. Jupiter is also bright, shining at approximately magnitude -2. With a telescope, you'll be able to see bands of clouds in Jupiter's atmosphere as well as its four largest moons: Europa, Ganymede, Callisto and Io. With a larger telescope, you may even spot shadows of the moons on Jupiter during Jovian solar eclipses. Two Galilean moons, Europa and Io, will cast shadows on Jupiter on Aug. 16, 2018. Europa will lead the way, beginning its transit at 7:56 p.m. EDT (2356 GMT). Io will follow about 9 minutes later, and the two moons' shadows will be visible until 10:10 p.m. EDT (0210 GMT on Aug. 17). Venus and Jupiter aren't the only planets visible in the night sky right now. If you look to the southeast, Mars (shining red) and Saturn (a yellowy white) are visible on either side of the constellation Sagittarius, according to the Space Telescope Science Institute. With a telescope, you can spot the famous rings around Saturn. Mars is under dust storm conditions, so not much is visible on its surface right now.